Roughly 70% of Icelanders belong to the Lutheran Church of Iceland, though only 45% claim to be religious. Whatever people think of god and religion, it's a fact that Easter is a National holiday in Iceland. This means a lot of places are closed on Maundy Thursday, Good Friday, as well as Easter Sunday & Monday. Most restaurant will stay open, but one can expect the majority of stores to close their doors sometime over the holiday. You can find more detailed information on opening hours at our site. According to Icelandic law, all festivities are strictly prohibited on Good Friday. This means that bars and clubs must close at midnight on Maundy Thursday and cannot open until after midnight on Good Friday. The same goes for recreational gatherings in public places like lotteries and card games. Excluded from this are cultural events like theatre shows, concerts and art exhibitions. To protest these laws, Icelandic atheists gather annually on Good Friday to play bingo. This is obviously illegal, although someone has yet to be arrested. Everybody is free to join, there is no buy-in fee and still, there are prizes to be collected. The bingo takes place on Austurvöllur in downtown Reykjavík. The most important tradition of Easter in Iceland, at least according to the kids, is the Easter Egg. This chocolate goodness is stuffed with Icelandic candy and like Chinese fortune cookies, a proverb can be found inside each egg. 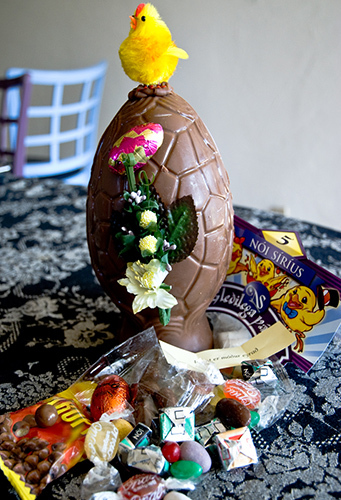 For the more adventurous, liquorice-chocolate eggs have become hugely popular in recent years. The Easter Eggs can be bought at most convenience stores. Another popular pastime over Easter in Iceland is skiing. Many Icelanders travel across the country to find the right slope. However, a perfectly suitable one can be found in Bláfjöll, only 30 minutes away from the city center. There you can rent skiing equipment, but you have to bring your own warm clothes. Last but not less important is the "Easter Leg". A typical dinner in Iceland on Easter Sunday consists of a roasted leg of lamb, sugar-glazed potatoes and gravy. If you have an access to a kitchen, we dare you to give it a spin! Otherwise, Icelandic chefs have been cooking lamb for 1000 years, so you should find plenty of options at the restaurants of Reykjavík. Most churches will have a few services over Easter, including those in downtown Reykjavík. On Good Friday, the St. Matthew Passion by J.S. Bach will be performed in Hallgrímskirkja Church.